One of my main goals at the moment is figuring out new and creative ways to solve for disconnected customer experiences where brands don’t communicate in a consistent voice across the customer journey. In our industry, the most successful companies have come to terms with the fact that traditional ways of serving customers are now insufficient and in some cases, obsolete. Convoluted, time-consuming IVRs that take customers on winding journeys and support processes that don’t get to the root of customers problems quickly enough simply aren’t enough to satisfy customers anymore. We have the technology and the tools to personalize and expedite customer experiences, and customers expect us to do that, rather than make them enter the same information several times before reaching someone who can help them. Instead of relying on inefficient, fragmented customer experiences, brands are now challenged to meet changing consumer expectations. Not only have we seen a proliferation in touchpoints with consumers, but we have also seen an increased expectation among consumers for a seamless, personalized experience across each touchpoint we interact with them at. Unfortunately, some brands continue to blindly pass the customer to disparate parts of the organization when their functional area’s job is complete. This gives the internal impression of success when in reality, the customer often encounters a great deal of friction as they are handed off to a different part of the organization. This disjointed experience is frustrating to consumers and can be to the organization as well if customers end up taking their business elsewhere without the organization understanding why. If you’re looking to change your organization’s approach to customer interaction, there are a few things to keep in mind as you do so, wherever you’re at in the process. Here are a few ways to work towards connecting with customers across every moment in the customer journey. Instead of settling for undifferentiated experiences served to the masses, customers now demand more atomized experiences served at exactly the moment they want or need them. This makes sense: a customer’s journey is, in fact, made up of a series of moments. And each of those moments provides a golden opportunity for brands to make lasting connections with new and existing customers. When we recall an experience, we tend to focus on certain moments that then define for us how we feel about the overall experience. Research on what psychologists call the “peak-end rule” shows that people tend to remember the best or worst moment—the peak—and the way the experience ended. Recognizing the impact of every moment as a potential peak allows brands to amplify the effects of positive experiences. If a customer has a negative experience in one peak, they could be frustrated enough to end the interaction all together. By understanding each peak’s individual importance and role in the larger journey, organizations can ensure customers are satisfied enough to reach the end of the journey and have a positive overall experience. That’s easier said than done, of course. To actually amplify the effects of positive experiences, we need to recognize each engagement and its unique needs. The better we do that, the better we can be at providing a memorable experience. One way many organizations think they can do this is with specialization. They dedicate entire teams to marketing, sales, and support, and then further specialize within those teams to handle things like billing, tech support, and more. What organizations doing this often fail to realize is that these company divisions aren’t actually connected to other customer experiences—they aren’t relevant from a customer perspective at all. In this approach, each department then looks at the customer experience as the interaction they are engaged in at a given moment, without acknowledging the numerous encounters the customer has previously had with the brand. We can’t individualize the engagement effectively if we don’t understand what has happened in the customer’s engagements with the other parts of the organization, and we need to equip each department with the tools to understand the entire customer journey. The challenge is balancing a need for individualization and personalization without creating deeper silos that isolate functions of the business and lead to inconsistent customer experiences. Capitalizing on moments can’t happen if we don’t first use data to connect the different points of a customer’s experience. Put the right systems in place to capture data, analyze it, and make it available in real time, and you’ll provide a better understanding of a customer’s journey and better equip your entire organization to more effectively support customers. Once you’ve identified the steps in your journey and the moments you’d like to improve and understand better, identify the best possible interaction at every one of those steps for every customer—from the first time a customer encounters your brand to the purchase process and any customer service issues. In every encounter and experience, organizations should be aiming to deliver the best possible outcome. It’s a lofty goal, and one to which data and analytics are integral. Most brands already possess a wealth of data about what customers need and want based on their implicit and explicit actions online. No matter the specific touchpoint—search terms, site interactions, location data, purchases, social engagements—brands can (and should) track every customer data stream they have access to. That data is a great starting point for understanding customers and improving their experiences. For example, if I see that a high value customer has spent 30 minutes online trying to solve a billing problem by reading our FAQs and then decides to call, I should put them in a priority queue to speak to a senior agent. I can even take it a step further and pass information along to that agent about what the customer has gone through in an attempt to solve their problem to ensure that the customer doesn’t face the dreaded redundant questions that plague many support experiences. These decisions directly improve customer experience, and they’re all possible with the right data. It’s possible now to combine website data, customer data, and third-party data from consumer databases to create robust customer profiles and predict the customer’s intent in real time as they are choosing to engage with a brand. Intelligent CX is an approach that connects systems, data, and teams to create a seamless customer experience from one brand touchpoint to the next. It eliminates silos in your business and creates a system that is stronger than the sum of its parts, reducing friction, building customer engagement, growing profits, and strengthening brand loyalty. At Clearlink, for example, we take the real-time data we receive from a customer’s online experience and marry it with CRM data as well as 3rd party demographic and psychographic data to predict things like the reason a customer is calling, a customers propensity to cancel their services, or their propensity to be up-sold or cross-sold a complimentary service. By using systems, data, and unified teams to predict and understand a customer’s true intent, we can build connected experiences that leave lasting and memorable impressions. We take the real-time data we receive from consumers and compare it to our billions of integrated data points and historical customer inputs. Using both real-time data for a specific customer and historical data from all of our customers means we are able to assess the specific outcome a customer is likely after. Having seen similar customers go through the entire journey thousands of times, we have an objective perspective of the probability that a specific current customer will be taking the same journey. Once we hit a certain level of critical confidence that a customer is headed toward a particular outcome, we can provide a more optimized customer experience. This predictive approach to customer service helps create a seamless experience. When we know what customers want before they actually tell us, we can then guide them through an effortless process. Making data and AI the forefront of customer experience design enables us to predict what our customers want without being told. By anticipating customer needs at each moment along the customer journey and using every incremental piece of input you receive from your customers, your organization can drastically improve the way you serve customers. A shift of this scale doesn’t happen overnight, but if you do it well, you’ll eventually be able to hand each customer you interact with the personalized journey that will result in a positive, successful moment for them. 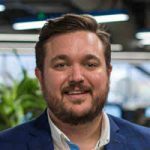 Jesse Himsworth is vice president of strategy and integrated solutions at Clearlink. A results-driven, dynamic marketing strategist, Jesse has demonstrated success in building and growing brands, driving qualified leads to sales teams, and providing training and sales support for complex marketing projects.